In our recap of the inaugural Groceryshop conference, we touched on the fact that retailers are developing innovative strategies to compete in the ecommerce game, the most important and interesting of which is the concept of ship-from-store fulfillment. This allows retailers to deliver orders to customers within hours, sometimes even in less than an hour, by picking and shipping from their local store. But what does this actually look like, and what kind of landscape are retailers facing in the race to be the fastest and most convenient e-tailer? One thing that retailers have over online platforms like Amazon is their proximity to shoppers. Although Amazon might have an impressively extensive network of distribution centers, the company cannot hold a candle to Walmart, considering that about 90% of the US population lives within ten miles of a Walmart store. At that point, delivering a television does not have to be so logistically different from delivering a pizza from the local eatery. For a corporation of this massive size, not only could they save on delivery time with a ship-from-store strategy, they could see significant savings in shipping costs as well. These savings should ultimately be passed onto the user, as consumers not only strongly value free shipping, they’ve come to expect it. According to a survey by AlixPartners, 96% of respondents said that the availability of free shipping impacts their purchase decision, and 73% said that free shipping has a great impact on their decision. Even Amazon has not been able to offer free shipping on all products to all users, so such an advantage could benefit retailers tremendously in winning back customers. In launching a ship-from-store strategy, retailers are going to have to consider how they want to handle personnel. Whether they retrain existing store staff in picking and packing or hire new team members to handle operations, successfully navigating and executing a human capital plan will be a key element in making the jump to ship-from-store. 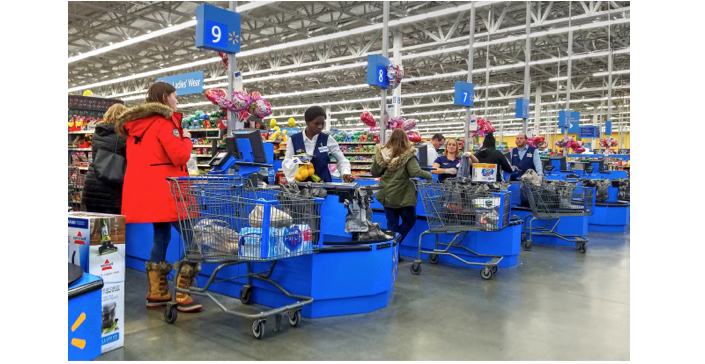 This may prove to be more difficult than it initially sounds, as Walmart quietly ended a pilot program in August that allowed associates to opt-in to delivering orders on their way home from work. The program was being tested in Arkansas and New Jersey, and associates in both states expressed discomfort in using their personal vehicles and car insurance for company business. They also balked at the pay structure established by Walmart, which paid them for an hour of overtime and $2 per packaged delivered. Comparatively, UPS drivers often make close to $20/hour, and much more for overtime. Walmart is said to be working on a new version of the program that better integrates delivery services into an associate’s normal work day, and is currently testing it out in Georgia. There may be consequences to redefining store associates’ roles to be more operational and focused on the online shopper, as another major component of retailers’ battle against Amazon is emphasizing the ability to offer in-store experiences. CVS, for example, is developing in-store “health hubs,” and Target is set to host more than 25,000 hours of holiday events in their stores. Retailers will have to figure out how to balance associates’ time between fulfillment and providing customer service, so that the all-important experiential component doesn’t get neglected. eCommerce is tricky, and as Amazon gets better at meeting the convenience demands of consumers, retailers are going to have to get very highly coordinated and streamlined in their efforts. If they can pull it off, however, they have a tremendous opportunity in front of them with ship-from-store.